Hi everyone! Today I'm finally getting around to posting another mani I have been meaning to share for a while. I wore Give Me One Good Raisin almost immediately when it arrived in my Girly Bits order because I just couldn't wait to get it on my nails! Give Me One Good Raisin is described as a 'deep bruised plum holographic polish, with a strong gold and copper flash' and it is just beautiful. If you're a regular reader you might know that purple is my favourite colour and when I saw this I just knew I had to have it. It isn't your typical purple holo. The formula was really good and I used 2 coats. I then used Barry M Silver Foil and Moyou Sailor 05 plate for the stamping. I love this design, it's so pretty and delicate. I finished off with a coat of topcoat as usual. Hi everyone! I recently joined a new group that features an indie maker each month and this month the spotlight is on 6 Harts! Courtney makes small batch polishes as well as cuticle oils in various scents. It's always nice to see a new release from her and the inspiration behind her colours! 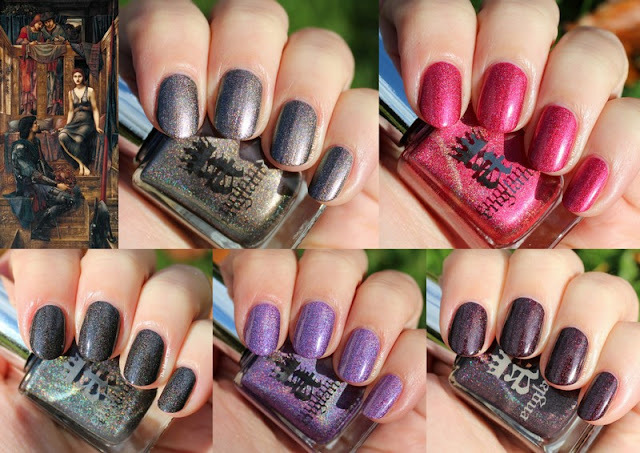 My all-time favourites from this brand are Bat Crap Crazy, an amazing shimmery brown, and Secret Galaxy, a shifty shimmer topper! Today though, I've chosen to show off a gorgeous red called Red Letter Day. This is a squishy jelly polish with glass flecks and various fine glitters. The glitter flashes blue and makes this polish really unique in my collection! For my mani I used 3 thin coats of Red Letter Day plus topcoat. The finish is squishy and reminds me of boiled sweets! Yummy! Don't forget to check out the other Indie Spotlight posts showing off more from 6 Harts!